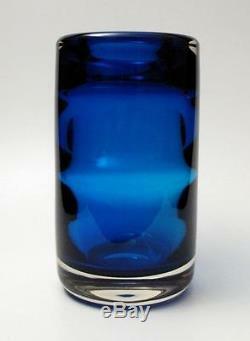 WHITEFRIARS GEOFFREY BAXTER ROYAL BLUE OPTICAL ART GLASS VASE MID CENTURY 9583. EXQUISITE VINTAGE WHITEFRIARS OPTIC ART GLASS. Presenting a stunning vintage royal blue optic vase, pattern no 9583, designed by the legendary Geoffrey Baxter for Whitefriars, England. This exceptional example has been expertly crafted with a vibrant layer of radiant royal blue encased within the sparkling crystal clear cylindrical shaped form. Exquisite internal horizontal optical ribbing magnificently distorts and refracts the light to create sensational optical illusions. The rich blue colour becomes electrified with a magical intensity as it reflects off the internal ribbing. The stunning internal optics radiate light throughout the sleek cylindrical form. This exquisite piece looks amazing with light passing through the thick-walled form, spectacularly illuminating the vibrant royal blue colour and casting gorgeous rich reflections. This exceptional example of quality Mid Century design would make a striking feature in any home and an outstanding addition to any retro glass collection! This piece is presented in excellent vintage condition, with no chips, cracks or repairs. There are a few small inclusions within the glass which have occurred in the manufacturing but mentioned for complete accuracy. Piece has been very well cared for and present spectacularly. This vase is beautifully finished with a quality, ground concave pontil mark to the base, with sufficient light surface scratches to the base to authenticate this is a genuinely vintage example. These impressive Whitefriars vase stands approx 160mms tall and measures 85mms in diameter. This stunning piece would make an outstanding addition to any Whitefriars, British art glass, Geoffrey Baxter design or Mid 20th Century design collection. This exceptional vase would make a fine feature in any modernist, eames era, retro or contemporary styled home. A perfect gift idea for the discerning admirer of fine quality vintage objects of sheer beauty! The item "WHITEFRIARS GEOFFREY BAXTER ROYAL BLUE OPTICAL ART GLASS VASE MID CENTURY 9583" is in sale since Sunday, October 09, 2016. This item is in the category "Pottery, Glass\Glass\Art Glass\British". The seller is "threetreefrogs" and is located in Melbourne, Victoria. This item can be shipped worldwide.